Vertically Striped Socks: Some guys just can't make a Fedora work. 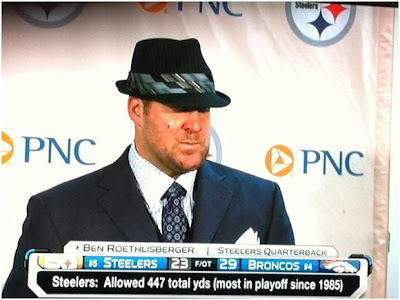 For anyone who was listening to Vertically Striped Radio's Episode 145 and wanted to see how ridiculous the hat Ben Roethlisberger was wearing after the Steelers lost to the Broncos in the Wildcard round of the NFL playoffs...here you go. Oh man, I was tweeting about that hat and making plenty of jokes! To quoth the late and great Rodney Dangerfield, you buy a hat like that you must get a free bowl of soup. Also, I think we now know why The New Radicals stopped making music - Their lead singer decided to become the starting QB for the Steelers.